Oral Kaplan – Interactive Media Design Lab. 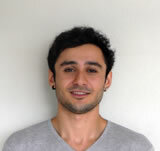 Oral received his Bachelor’s Degree from Izmir University of Economics, Turkey in 2011. After graduation, he worked in Istanbul R&D Centre of Huawei Technologies Co. Ltd. as a Software Test Engineer. In 2013, he received The Ministry of Education, Culture, Sports, Science, and Technology Scholarship and moved to Japan with the aim of pursuing an academical degree in Information Science. He received his Master’s Degree from Nara Institute of Science and Technology in 2016. Currently, he is a First Year Doctor’s Degree student in Interactive Media Design Laboratory of Nara Institute of Science and Technology. In general, his research interest covers the application of information science technologies in sports and exercise fields; mainly towards both professional and unprofessional cycling.